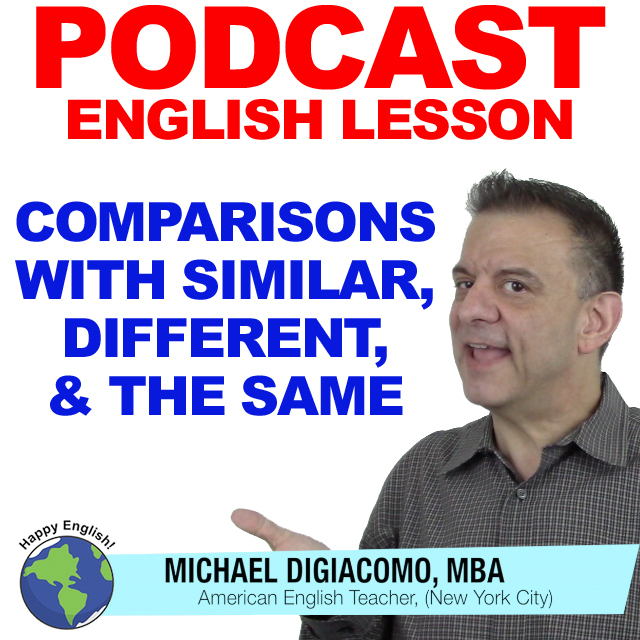 When we compare things or people, we can use the phrases different, similar, and the same. For today’s English lesson, let’s have a look at how we can use these three phrases. All three are used as adjectives. New York and San Francisco are different cities. Jack and Jenny have different ideas about decorating the living room. We have different classes on Tuesdays. New York is different from San Francisco. Jack’s ideas about decorating the living room are different from Jenny’s. My classes on Tuesdays are different from yours. A taco and a burrito are similar foods. Jack and Jenny have similar ideas about painting the house. Biology and Chemistry majors often take similar classes. A taco is similar to a burrito. Jack’s ideas about painting the house are similar to Jenny’s. Biology majors’ required classes are similar to Chemistry major’s classes. Norma Jean and Marilyn Monroe are the same people. Jack and Jenny have the same ideas about painting the house. Biology and Chemistry majors often take many of the same classes. Tom’s house is the same as mine. Jack’s ideas about painting the house are the same as Jenny’s. Biology majors’ required classes are the same as Chemistry major’s classes. Tom’s house is the same size as mine. You have the same pen as I have. Tommy has the same classes as Joey.